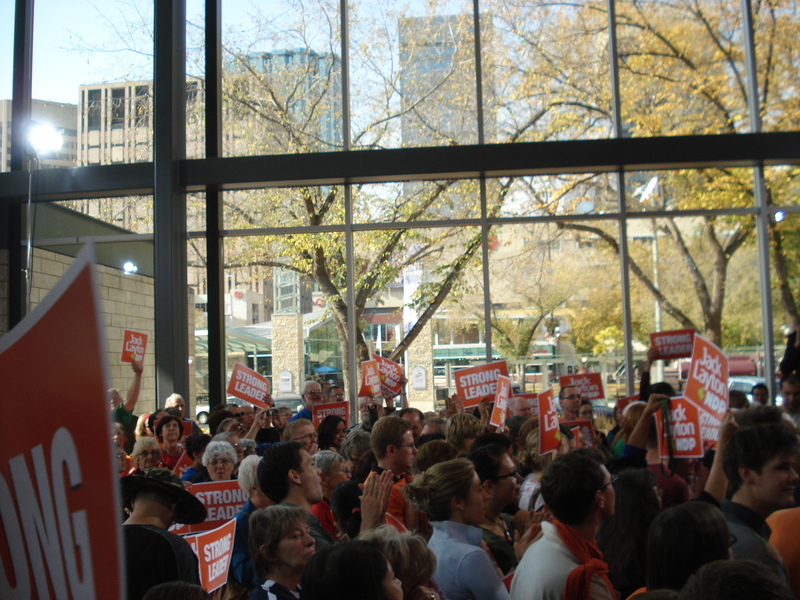 In the past provincial election I intensely covered the Edmonton-Strathcona and Riverview (provincial) ridings all-candidates forums at the University of Alberta. For this election, the boundaries of Strathcona are a bit different (larger) and include a diverse liberal, New Democrat and Conservative support base (often leading to vote splitting in the past). I’d just like to point out that before I got in I wasn’t allowed my popcorn or pop, a dissapointment. The format was opening statements (1 min each), then prepared questions (1 min response and 30 s rebuttals), then audience questions (30 s responses), then closing remarks (1 min each). Also, as you can see in the top corner, I’ve already endorsed Linda Duncan officially, but I did go for quotes for all and to see how they all stand on their own merits. 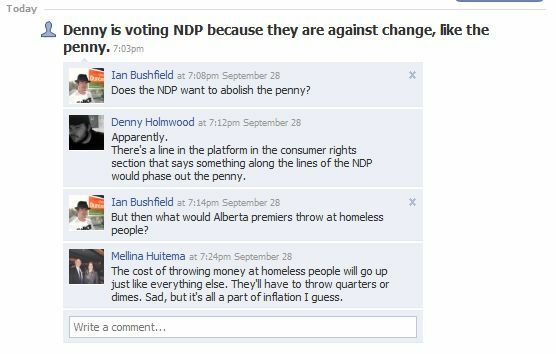 In the Riverview forum last election, the Wildrose Alliance candidate appreciated my fairness / objectivity, despite us having almost polar opposite economic views. Typically the phrases evangelical voting and election refer to our Southern neighbours, but apparently they’re working equally hard to win this election. So Google has a fun time killer (among others) called Google Trends. Using the tool you can compare various searches over the past 30 days (or several years), and to only Canadian searches. So what do we get if we look at the election (excluding the Bloc, because no one outside Quebec should give a damn about anyways? Update: It appears the UofA’s Candidates forum has been postponed to Monday. I guess Jaffer made his priorities known. 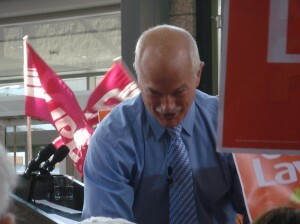 It looks like Harper accepted Jack Layton’s challenge and is coming to Edmonton – this Thursday (at the Ramada Inn on Kingsway). Unfortunately, this is also the day of the Edmonton-Strathcona all-candidates forum. It will be quite telling to see if Jaffer values his party or his constituents more. The Tories have dropped one percentage point over a week, and the Liberals are down three points. The NDP is up two points at 17 per cent, and the Greens are also up two points at 11 per cent. The Bloc Québécois (BQ), which is running candidates in Quebec alone, is unchanged at eight per cent. Basically, what they report is that the Liberals are losing ground, but to the NDP and Greens. What I really find interesting is that now if the NDP and Greens pooled support, they would defeat the Libearls for the opposition status (the Liberals have 23% support in the poll). With a couple weeks to go it’s just a matter of Jack Layton convincing the rest of his potential supporters that he has the best platform to tackle Canada’s environmental difficulties. Layton’s ranking is 16, the BQ’s Gilles Duceppe 12, the Green’s Elizabeth May 10, the Conservatives’ Stephen Harper four, and Dion minus 24. Re: “Voters not buying what leaders are selling; Poll; Widespread dissatisfaction makes another minority government more likely: Ipsos Reid,” The Journal, Sept. 18. The reporter should check his facts when he says the Conservatives approval rating is “64 per cent in Harper’s home province of Alberta.” Stephen Harper was born and raised in Toronto. Every day I move more comfortably into the NDP camp and feel better about supporting this campaign. (The first bit of the interview starts at 24:30 of the current episode of The National, which I think will be up until tomorrow night – unless I get it off their servers). This past election in Alberta featured record low voter turnout (40%), and now the chief electoral officer has released a report on what the government needs to do to restore democracy in this province. Lorne Gibson’s report counted 257,176 people who showed up on election day and discovered they were not registered — 27 per cent of all March 3 voters. Basically, the government claims it didn’t have the time or money to hire enumerators in this province to actually figure out who lived here so that they could have voter lists on election day. Another issue was that the returning officers were appointed by the Tories. This potentially led to polls being strategically chosen to make it difficult to vote for certain populations. Among the 182 recommendations are non-partisan returning officers (hired by Elections Alberta) and fixed elections dates. “We’ll be making a review of the full 182 recommendations and responding in due time,” said Justice Minister Alison Redford. She said the government has already begun reviewing some recommendations — such as allowing Elections Alberta to hire returning officers who would not be appointed directly by the government — because Gibson outlined them earlier in a 2006 report. “It was more a question of timing and the legislative schedule as to why we didn’t respond,” Redford said.